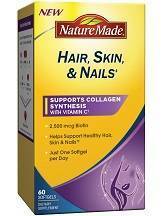 What is Nature Made Biotin Hair Skin and Nails Liquid Softgels? If you want to find out more about the ingredients, price and efficacy of Nature Made Biotin Hair Skin and Nails Liquid Softgel, then this is the review for you. Nature Made Biotin Hair Skin and Nails Liquid Softgel is a versatile product which, while the boosting of hair growth is its primary function, can also be used to increase the health and virility of the skin and nails. Nature Made Biotin Hair Skin and Nails Liquid Softgel contains high quantities of biotin, as well as a healthy supply of vitamins in order to ensure that your hair grows fast and grows strong. If you want to find out what we think of Nature Made Biotin Hair Skin and Nails Liquid Softgel, keep reading. Nature Made Biotin Hair Skin and Nails Liquid Softgel has an atypical formula in relation to other hair growth supplements, though the usual inclusion of biotin is present here also. The difference in the formula may be attributed to the fact that Nature Made Biotin Hair Skin and Nails Liquid Softgel is designed to improve the condition of not only the hair but the skin and nails as well. The product supplies your body with much needed nutrients that are quite simply missing from the average diet, and their deficiency can cause hair loss to manifest. The recommended daily dosage for Nature Made Biotin Hair Skin and Nails Liquid Softgel, as suggested by the manufacturer, is one pill. These should always be taken with a meal, as when you’re stomach is digesting, the contents of the pill will be better absorbed. One package of Nature Made Biotin Hair Skin and Nails Liquid Softgel, containing 60 pills, which is supply enough for two whole months, costs $11.75 on Amazon. This is an extremely low price, especially when comparing it to the competitors’ products. Nature Made Biotin Hair Skin and Nails Liquid Softgel is an entirely safe to use product, though pregnant women should steer clear. Nature Made covers all their products with a 100% unlimited money back guarantee, which is a great move. While Nature Made Biotin Hair Skin and Nails Liquid Softgel is really cheap, and is covered by one of the most beneficial guarantees in the industry, none of this counts for much when, in the end, the product produces results very slowly, and the quality of the improvement also leaves much to be desired. As a result, we would recommend that you keep looking for a more suitable hair, skin, and nail product.